As I did last year, this post will be divided into three primary sections. First I will list the main awards and follow each category with how I did with my predictions; at the end will be the full tally. Next I will list the rest of the nominees. Finally, last but not least (well, maybe), I’ll type out a few initial reactions of my own to the announcement. ^ – Did not predict Best Documentary Feature. Best Picture had ten nominees (instead of nine), and Best Animated Feature had three nominees (instead of five). – I am most pleased to see so many people get that coveted “triple play” of nominations – earning nods for Screenplay, Direction, and Picture. Continuing in a tradition often experienced by past nominees like the Coen brothers and Quentin Tarantino this year are the outstanding trio of Woody Allen, Alexander Payne, and newcomer-to-the-craziness Michel Hazanavicius. I can’t help but wonder how close we were to seeing four examples; Terrence Malick earned shots at Picture and Direction but couldn’t quite nab that Original Screenplay slot. – I am floored by how many of my “WiLd CaRd” picks defied my thin doubts and pulled through to make it to the ceremony. The only WiLd CaRd picks that didn’t make it were Melancholia for Best Picture, Shailene Woodley for Supporting Actress (thankfully in this case since it was the only category I perfectly predicted), and War Horse for Adapted Screenplay. I’d say my riskiest guess of a WiLd CaRd was Foreign Language nominee Monsieur Lazhar since I haven’t seen any of the films that made the Academy’s Foreign short list beforehand. I will come clean and admit that I picked it judging by its title only. Of course, the WiLd CaRd I’m most excited to see advance is Gary Oldman who earned his first ever Oscar nomination at the age of 53 (I really should see TTSS). – With apologies to Mr. Spielberg, I’d say the most shocking snub this year is the Academy’s omission of Albert Brooks for his big-time critically recognized performance in Drive. Brooks’ villainous turn earned prizes from Boston, San Fransisco, the National Society, the New York Critics Circle, and the New York Critics Online – not to mention nominations from the Golden Globes, the Critics Choice awards, and the Independent Spirit awards. In short, he was pretty much doing just as well as the suggested Supporting Actor front-runner Christopher Plummer (for Beginners). In a very close second place of biggest suprise snub (though I suppose not in retrospect – three or more comedies in one of any category is a high hope) is the absence of Will Reiser’s 50/50 in Best Original Screenplay – the shut-out film’s strongest chance. Other notable snubs: Bridesmaids and The Girl With the Dragon Tattoo for Best Picture, Leonardo DiCaprio (J. Edgar) and Michael Fassbender (Shame) for Actor, Tilda Swinton (We Need to Talk About Kevin) for Actress, Shailene Woodley (The Descendants) for Supporting Actress, Tate Taylor (The Help) for Adapted Screenplay, The Adventures of Tintin for Animated Feature, Bill Cunningham New York and Project Nim for Documentary Feature, and both David Fincher (The Girl With the Dragon Tattoo) and – as I mentioned – Steven Spielberg (War Horse) for Direction. – Here’s a whopping achievement to consider: As of today – starting from her first win for Kramer vs. Kramer – Meryl Streep’s seventeen Oscar-nominated years outnumber her sixteen un-nominated years. Despite all the recognition, Streep has won an Oscar twice (Her second win was for Sophie’s Choice). That said, as most screen actors will tell you, just netting a nomination is difficult enough and winning just one Oscar is extraordinary. – The only two people to achieve back-to-back nominations this year are Michelle Williams (returning to the Actress race from last year’s nomination for Blue Valentine) and Aaron Sorkin (returning to the Adapted Screenplay race after winning the award last year for The Social Network). – Blunt truth time: If there is any nomination I don’t feel is entirely deserving, it’s Rio for Best Original Song. One of my chief complaints about Rio (as I stated in my Worst of ’11 list) is all of its easily forgettable music – a major error for any film categorized as a musical. All of my support for this award goes to the other nominee (only two this year?) – “Man or Muppet” from The Muppets (I’m so happy the one song I downloaded from the film turns out to be the film’s sole chance for a win). This song should make for a very fun performance during the live ceremony’s telecast. Fingers crossed for another cameo from Jim Parsons! – If I had fully predicted the nominees for Best Makeup, those nominees are the three I would have picked – especially in light of knowing J. Edgar wasn’t in the running. Too bad I never predict technical awards (short of this year’s certainties) and never will. – It’s a shame the Razzies started a new tradition of announcing its nominees the day before the Oscars ceremony rather than the day before the Oscars nomination announcement. I always found delight in discovering which – if any – films would net nods from both sources. Who could forget past examples like Transformers: Rise of the Fallen or Pearl Harbor? Thank you for reading. 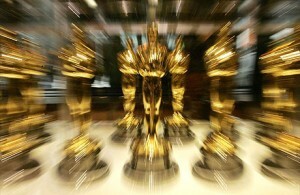 The Academy Awards are February 26th. Some point before then, I will post my list of predicted winners – so be on the lookout!